I decided to take a nap today after a late night gossip session with Mr. Justin Lacey and almost forgot to write Cheap and Dirty. Fortunately, being cheap and dirty is built into me and my body’s natural alarm system roused me from my slumber. This has allowed me to bring you Slime Laboratory, a game that’s catchy intro music will infect your brain and make you almost forget to actually play the game itself (once you actually do start playing, the catchy-ness of the tunes stops pretty dramatically). Slime Laboratory is a physics-based platformer that puts you in control of a green blob who’s attempting to escape a secret lab of some sort. 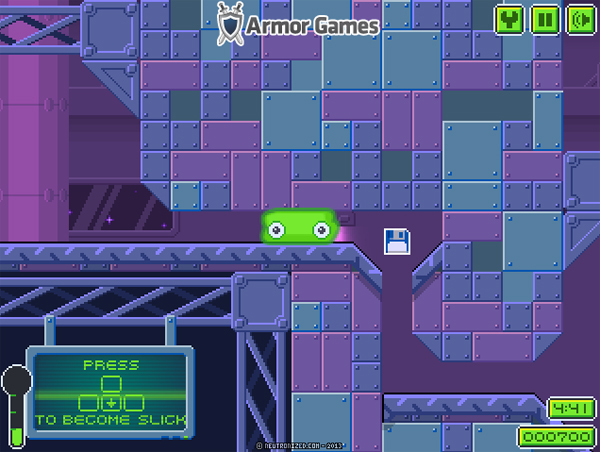 Because you’re made of slime, you’re able to squeeze through tiny spaces, grow in size to jump higher, and generally ooze around the levels dodging through a number of environmental obstacles. You’re also supposed to pick up hard disks. I’m not sure why, but then again Sonic collected a bunch of golden rings so who are we to judge. I don’t trust blobs, but I respect how difficult it must be to exist in a very anti-blob world. Even when our little blob does finally achieve freedom, he’ll be entering a world that’s primary goal is to absorb unwanted stains onto pieces of paper towel. Seeing as it probably can’t communicate, I’m afraid our little hero may be a future victim of that lumberjack from the Brawny commercials. But I digress. Not sure what a blob needs with hard disks, unless you has a JPEG he needs to transfer to a buddy. 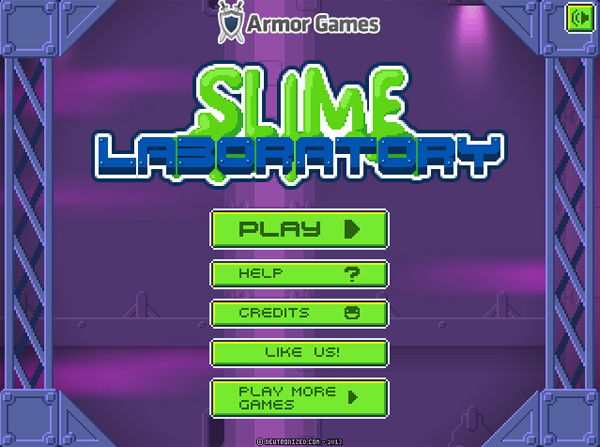 Slime Laboratory is not exactly an easy game, especially once lasers come into the mix (right after the third level) but there’s something to be said for a charming little challenge. I like a difficult experience every now and again though I have to say that I’m probably going to need to take a break from platformers sooner or later. Anyway, go and help that little blob escape into the real world, something that’s arguably more frightening than the sterile confines of his laboratory prison.